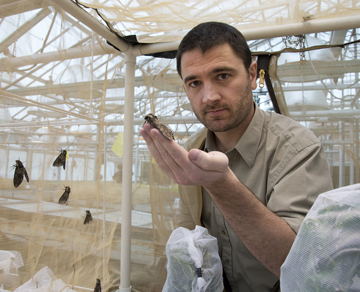 Ian Kaplan, assistant professor of entomology at Purdue, might study some small creatures, but his work recently has taken him to a big stage. In July, Kaplan was one of 96 U.S. researchers who received a Presidential Early Career Award for Scientists and Engineers (PECASE) in Washington, D.C. The award, which is the highest governmental honor bestowed on early-career scientists and engineers, recognized Kaplan's research into ecological approaches to pest management. A native of New York, Kaplan says unlocking the secrets of insect ecology -- and therefore helping farmers protect their crops -- is one of his primary goals. What are the details behind your presidential award? I was nominated for the award through the U.S. Department of Agriculture, which in fall 2010 awarded me a grant to study the volatile chemicals tomato plants release to attract insects that eat pests. I found out I received the award in mid-July, about two weeks before the July 31 presentation ceremony in Washington, D.C. I received the award at the Smithsonian Institution and then traveled to the White House, where the winners got to meet President Obama and take a tour. It was a fun and exciting time, but it was also a different experience because I'm far more comfortable and accustomed to working out of the spotlight. Could you elaborate about your research? I have a lot of ongoing projects, but the biggest is the work funded by the USDA grant. That research looks at how plants attract predatory insects to fend off pests that are harming them. For example, the chemicals tomato plants emit attract ladybugs, which eat aphids that otherwise would damage the crop by removing plant sap and transmitting viruses. The chemicals also attract parasitic wasps, which lay eggs inside caterpillars, eventually killing them before they can eat too much of the plants' leaves. My research investigates the feasibility of these ecological approaches to pest management; I hope to help tip the scales of these processes in the farmers' favor, so their crops can become more protected from pests. How did you become interested in entomology? A long path led me to this career choice. While I was completing my undergraduate degree at Davidson College in North Carolina, I became interested in ecology and in environmental management. I spent a lot of time working with snakes, frogs and turtles -- at that point, I wanted to be a herpetologist. My interests then moved to birds and ornithology. I actually stumbled into entomology while working a summer job at the Schiele Museum of Natural History in Charlotte, N.C. I spent my time there identifying and preserving insects, which I really enjoyed. After I learned that entomology had a wide variety of practical applications, including in agriculture, human epidemiology and urban pest management, I decided to pursue it as a career. I later received a master's degree in entomology from Auburn University in Alabama and a doctorate in entomology from the University of Maryland. So far, my work has mostly focused on theoretical approaches to understanding plant-insect interactions at a conceptual level. While I enjoy that kind of research and strongly believe it has long-term value toward improving crop pest management, I'd eventually like to pursue projects that have more immediate and tangible applications for sustainable agriculture here in Indiana.